When a review opportunity from CursiveLogic for their CursiveLogic Workbook came up, the only dilemma I faced was which dear child to have work on this. Sterling and Ruby both learned cursive last year without a curriculum as I taught them A-Z, one letter at a time. 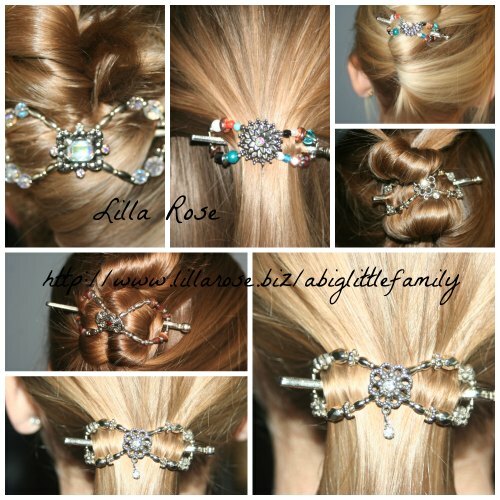 It was a painful, tedious, and tear-inducing process. In the end, since Sterling is older and picked it up a bit easier than Ruby, I chose Ruby to work on this. She’s 6, soon to be 7, and will be doing 3rd grade work this fall. 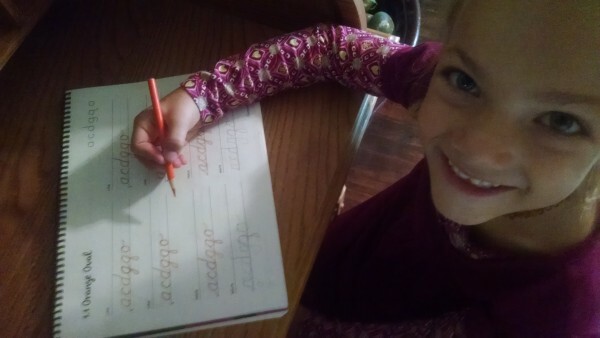 CursiveLogic was designed for ages 7 to adult, but while Ruby was just a tad younger, the ease of CursiveLogic made cursive make sense for her. The first thing I noticed when I flipped through the CursiveLogic workbook was the simplicity of it. By grouping certain letters together based on similarities, giving them a color based on their groupings, and learning them together, Ruby learned half a dozen letters the first day and could link them together by the third day. There wasn’t a definite beginning and end to the lessons that gave us “Day one, Day two…” lessons so we worked on a few pages each day until Ruby was tired of it each day. We have yet to finish the book but we definitely will be continuing it this summer and fall. We chose to use a colored pencil often – ie., all the orange letters she wrote with an orange colored pencil. Whether this was simply fun or helped concrete in her mind which letters belong in which group, I haven’t decided, but she had a great time with it regardless of what purpose it served. Amazing part: Ruby loved it. She asked to do it. I’d catch Sterling sneaking a peek over her shoulder to see how she was doing so well when last year had been a world of frustration for her. With catchy little phrases Ruby chanted as she wrote like letters, she reminded herself of the process and order and she did fantastic. Her handwriting has improved in the last few weeks worlds more than all last year when I stumbled along without a curriculum. She learned to link the letters together and did an amazing job remembering how each letter ought to look – something that never clicked last year. While I’m certain age and maturity didn’t hurt her any, the thrill of the workbook was definitely a contributing factor and I plan to continue utilizing the methods we learned in CursiveLogic. The CursiveLogic Workbook is $29.00 available here. It contains 94 pages of instruction, handwriting practice, and three additional pages that are dry-erase for extra practice in a spiral bound book. These three pages are particularly fun for Ruby – markers just make things so much more enjoyable! I also received three downloadable ebooks for extra practice. You’ll need to purchase the workbook to be able to use the concepts with these pages, but I love that Ruby is getting extra practice on her handwriting while writing Psalms, the Gettysburg Address, and the Declaration of Independence! CursiveLogic can be found on Facebook, Twitter, and Instagram. 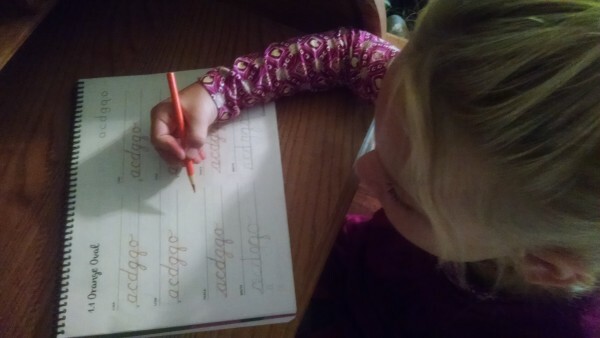 For more reviews from the rest of the Crew on CursiveLogic and their cursive handwriting teaching method, check out the Review Crew Blog. This seems to be a great cursive book. A shame the public schools see no need to teach this any more. I wish they don’t need a real signature on anything these days. Cursive used to be very important. Still is to me. It still is to me too. I’m determined my kids will know how to write and read it. Eden even prefers to use it always. I’m glad! I don’t think you need to worry about not starting the school year yet……You are doing an Awesome job!!! Oh my, some days I wonder. I asked the kids yesterday what they’d learned that day. Everyone thought of something. Pierce just shook his head. “I didn’t learn nothing. I just played house and dolls with Charlie.” Oh boy.